In this line of Buddhas, the statues are as sedate as the seats are ornate. 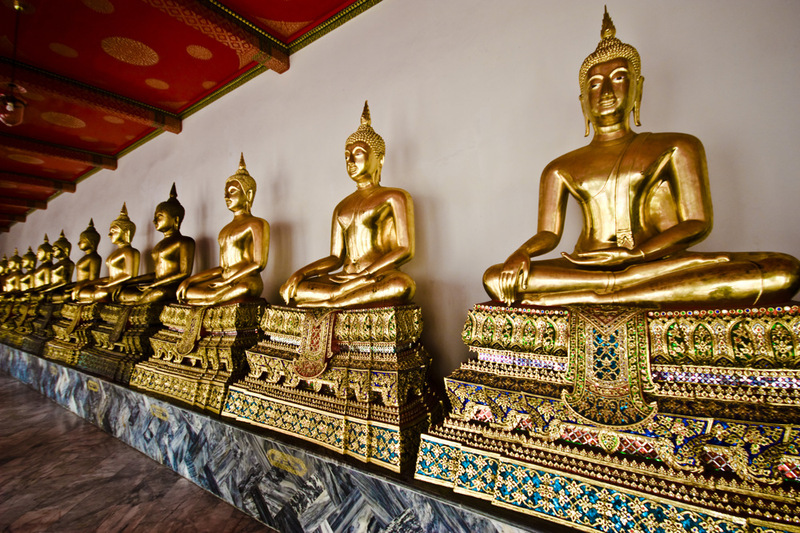 There is no shortage of Buddha icons in Thailand, Ayush. Ayush Basu: Likewise, Ray, it was nice to meet up finally. The snail on the leaf shot came out nicely, imo. You made a rhymie!! Lovely capture Ayush! Was great to see you and Ray on his slideshow! It was nice to meet him in person and our conversation did turn to so many other meetups involving SCers elsewhere, all the time. Thank you. Ayush Basu: Yes it does, Lisl, thank you for that input. Ayush Basu: Thank you Michael, I thought so too. I hate to ask a silly question but why do they need so many? Ayush Basu: Far from silly, a very good question Chris. To be entirely honest, I have no clue but I would suppose they show Buddha in different postures/moods. If I am not mistaken, there are 88 different versions but then again that is the Chinese touch, it may not be the same case here in the Thai version. Sedate, ornate, opulent...and I'm with Chris: why do they need so many???? Ayush Basu: Thank you for your comment Ginnie. To be entirely honest, I have no clue but I would suppose they show Buddha in different postures/moods. If I am not mistaken, there are 88 different versions but then again that is the Chinese touch, it may not be the same case here in the Thai version. Great to see the picture of you and Ray! Like the others I can't help wondering why so many? Ayush Basu: It was nice to meet him in person and our conversation did turn to so many other meetups involving SCers elsewhere, all the time. Thank you, Bill. To be entirely honest, I have no clue but I would suppose they show Buddha in different postures/moods. If I am not mistaken, there are 88 different versions but then again that is the Chinese touch, it may not be the same case here in the Thai version. Nice meeting you at Ray's blog. Always nice to meet up with Shutterchancers. Great picture of the lined up Buddha's. The reason for so many is that many people can pray at the same time??? Ayush Basu: It was nice to meet him in person and our conversation did turn to so many other meetups involving SCers elsewhere, all the time. Thank you Astrid. To be entirely honest, I have no clue but I would suppose they show Buddha in different postures/moods. If I am not mistaken, there are 88 different versions but then again that is the Chinese touch, it may not be the same case here in the Thai version. But your theory too makes sense to me. Right opposite is a vast courtyard. Blimey Ayush, they seem to be two-a-penny here. Ayush Basu: Oh yes Chad, that is certainly a strong inference to be drawn. My wide angle lens was panting to capture them. I do not know a lot of the buddhist religion. Is this a case of one Buddha and many statues of the same personage or are there indeed many Buddha's? Ayush Basu: I am not sure if there was only one Buddha or several. Buddha the term itself means one who has attained enlightenment and usually the most well known Buddha is Gautam Buddha. To be entirely honest, I have no clue but I would suppose they show Buddha in different postures/moods. If I am not mistaken, there are 88 different versions but then again that is the Chinese touch, it may not be the same case here in the Thai version. Everyone seems to have a hand out at this time of year, even Buddha. Excellent shot, as always. Ayush Basu: Ahh excellent eye for detail Mary thank you warmly. All in the same "earth witnessing" posture, too. Ayush Basu: Yes Tom but there are some elsewhere with different postures or "mudras". Wow, Ayush, if I didn't know better I would think these Buddha statues had been massed-produced and came off an assembly line. The jeweled bases are simply stunning; the intricate designs are incredible. Nice to see you & Ray at your meetup; a very enjoyable one I'm sure. Ayush Basu: I think it is a similar scene in several other wats too Beverly. It was nice to meet him in person and our conversation did turn to so many other meetups involving SCers elsewhere, all the time. Thank you. Bold and Gold! well captured! There is certainly some beautiful work in that display of idols. Ayush Basu: Yes Brian, both the statues themselves and their presentation. It's good to "meet" you and Ray. Ayush Basu: It was nice to meet him in person and our conversation did turn to so many other meetups involving SCers elsewhere, all the time. Thank you for the comment on the photo Anne. What a gorgeous line-up Ayush! Such a nice place to relax. They draw the eye due to composition of your photo. Ayush Basu: Yes, very nicely done Peter. Glad you liked it.